After reading a couple of the comments on my last post about splitting invisible zippers, it seems I’ve been had. This is a small selection of zippers in my stash, all of them purchased from either my local Fabricland or World Sew Centre from the Fashion District downtown. If you zoom in, you can see that all the zipper pulls have YKK on them. So you’d think you’d be getting a YKK zipper, right? Wrong. 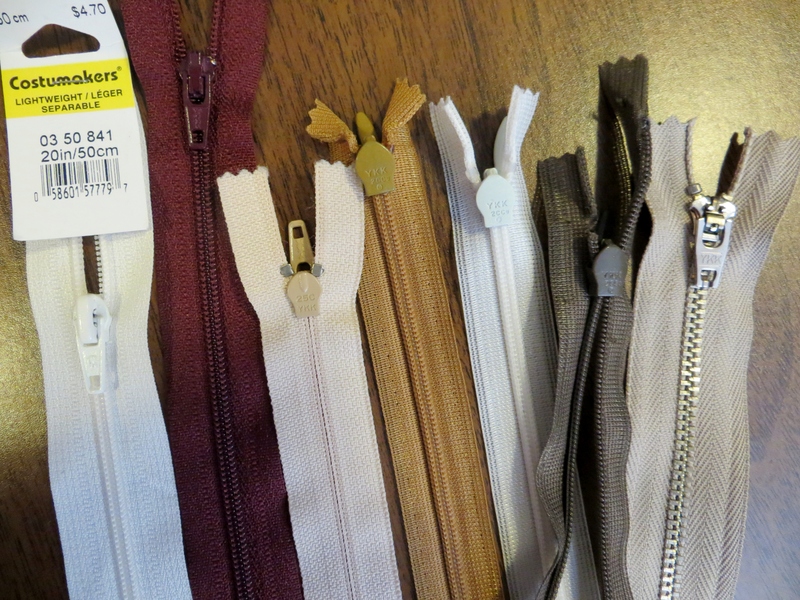 The only genuine YKK zipper is the metal zipper on the far right. Since Jen (NY) left her comment, and Anne from Mercury Handmade’s similar comment on my previous post, I’ve been scouring the internet looking at closeup’s of YKK zippers on websites. Guess what I learned? I’ve been buying crap imitation invisible nylon zippers. With a “YKK” imprint on the sliders. So, I’m going to scrounge around the internet and order some from somewhere, and then, on August 10th, when the Toronto Sewcialists meet up, I’ll pick everyone’s brain and scour the fashion district in the hopes of finding a local genuine YKK vendor. < Previous One Year Later: Vogue or Burda trouser block? Well the rotten cheap fakers I didn’t know that either. I get my YKKs from one of the fabric stores in Wellington (NZ) and haven’t had a problem yet but the local (cheaper) habadash place has told me they do them too. Hmmm. Thanks for posting this. Very interesting. I love trivia like this. Thanks for sharing. I’m also really liking all the comments on this post — very helpful! Wow! For the last long while I’ve been snubbing what I thought were YKK zippers (but now I am thinking are fakes from that P-named store) in lieu of Excella’s which I didn’t realize actually are YKK zippers. At least the moral of the story for me is that I can trust my judgement. Yup, I concur with this (and substitute NZ for Aus). Zipperstop also have their own website – at least I think they are the same company! I bought mine from http://www.zipperstop.com/ good price, genuine stuff! Yeah, well I think I’ll make use of what I can and thrift or trash the fake invisible ones, since those are the zips I have the most trouble with. Hi, I think this website: http://www.ykkfastening.com/products/zipper/ lists the types of genuine YKK zippers 🙂 (if it’s of any help to you). Plus this page http://www.ykkfastening.com/brand/index.html details about their ‘Anti-Counterfeiting Measures’ too. Thanks, Claire! This is helpful.